Premier’s Reading Challenge participants read a record-breaking 2.46 million books in 2018. Help reach a new record in 2019 – registrations open Term 2. 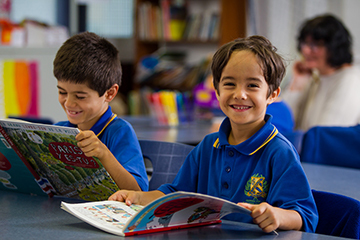 The Premier's Reading Challenge is an annual statewide initiative for state and non-state schools and home-educated students from Prep to Year 9, as well as children (aged up to five years) enrolled in an early childhood centre. The Premier's Reading Challenge aims to improve literacy and encourage children to read for pleasure and learning. In 2018, more than 2.46 million books were read by more than 180,000 Queensland children and students from 1,012 schools and 388 early childhood centres.